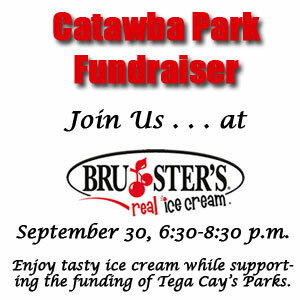 The ?Tega Cay Parks & Recreation is spearheading efforts to raise money for the development of Catawba Park. Initial money raised for Catawba Park will be used to build and develop 10 acres of park space, which will include three multi-fuctional fields that are desperately needed to accomodate youth recreational sports. A fundraiser has been scheduled for September 30,?to be held at Bruster’s Ice Cream from 6:30 p.m. to 8:30 p.m. Please come out and support the future of our programs, by enjoying some ice cream, while insuring additional space for our entire community to play.? Click to view the Catawba Park Master Plan (Final) bw.